Since we’ve been talking a lot about dishcloths and washcloths this week, I thought I would head to Ravelry and check out some of the most popular washcloth knitting patterns over there. Here are some that caught my eye; I hope you like them, too! Knitted flower washcloth from Canadian Living magazine (image is by Flickr user incowtown via Ravelry, by the way). This one is a Google Doc for a washcloth that holds soap, a super-clever pattern from Mary Ann Borden-Neary. The Leafy Washcloth by Megan Goodacre is a really cute one that can be worked in garter stitch or stockinette. 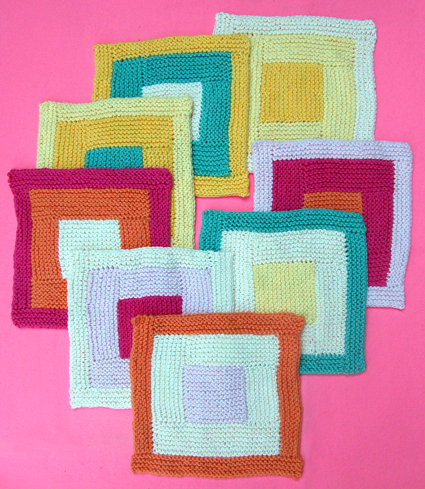 Purl Bee’s Log Cabin Washcloths are little works of art you can wash your face with. The dragonfly washcloth from Southern Fried Goodness reminds us that all it takes to make a basic cloth a little more special is a little bit of design. I love the hugs and kisses cable (actually used it in a couple of projects in my book!) so I couldn’t resist sharing the hugs and kisses washcloth by Little House in the Suburbs. The ears of grain washcloth is pretty and would make a great cloth to have out when guests are over. It’s a free Ravelry download. And the Double Bump Washcloth, a really fun textured pattern, also a Ravlery download, looks like a lot of fun and would make a great stitch pattern for a scarf, too. Need more clothy inspiration? 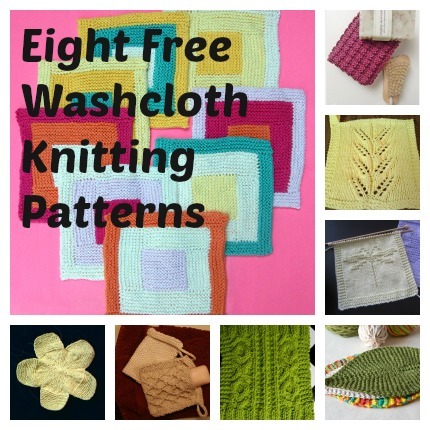 I have a collection of free washcloth patterns at About, and you can always check the washcloth/dishcloth section of Ravelry for tons more ideas.